PediFix Nighttime Bunion Regulator™ relieves pain by alleviating strain that causes a crooked big toe and a bunion deformity. PediFix Nighttime Bunion Regulator™ relieves pain by alleviating strain that causes a crooked big toe and a bunion deformity. This anatomically-shaped splint guides the big toe towards its normal position while gently stretching tendons and muscles to help slow progression of the condition. Recommended by doctors for people who want to avoid or postpone surgery. 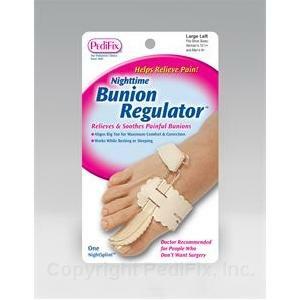 Works at night while you sleep to relieve bunion pain! * Buy more, save more with shipping.